The advent of large-throughput data is transforming life sciences into an increasingly quantitative discipline. The University of Lausanne is at the forefront of this revolution, with more and more quantitative research throughout the Faculty of Biology and Medicine, a dedicated department of Computational Biology, and interdisciplinary units such as the Center for Integrative Genomics. UNIL also hosts the headquarters of the Swiss Institute of Bioinformatics, to which many quantitative research groups are affiliated, and closely collaborates with EPFL on the same campus. Ideally situated along the lake of Geneva, near Lausanne’s city center, UNIL brings together over 120 nationalities. 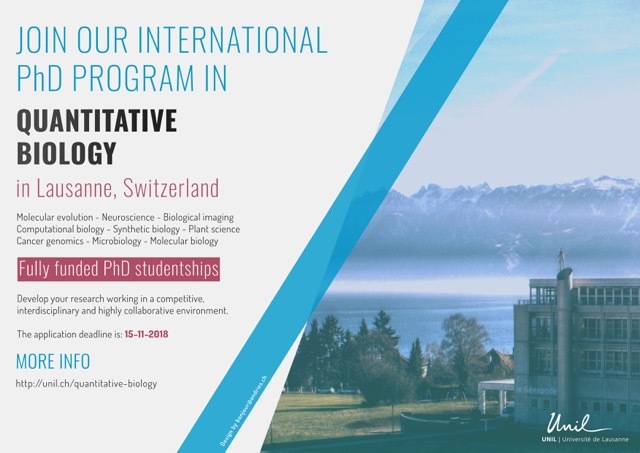 UNIL’s Faculty of Biology and Medicine has launched a new doctoral program entitled “Quantitative Biology” (http://unil.ch/quantitative-biology). * Curriculum vitae including, if available, extracurricular activities, internships, publications, conferences, awards, software contributions, etc.